All you can say is Wow. Here was a little company whose leap of faith had landed them incredible success. The movie Marquee cover tips your hat to the Big winner in 1974, the capturing of the Planet of the Apes licensing which made Mego a juggernaut. The future was bright and Mego made calculated efforts to keep it that way. The Mego Superheroes saw many an addition and spinoffs, highlightinh just how creative the Mego R&D department really were. Other highlights include Action Jackson , Fighting Yank and a little Girl known as Dinah Mite. 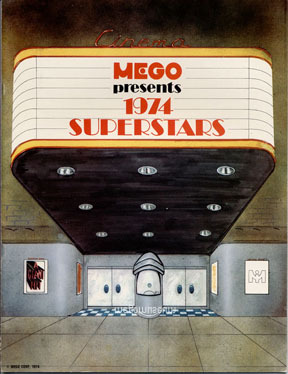 It can only be imagined how great a time must have been had working for Mego in 1974, everything is full of promise. 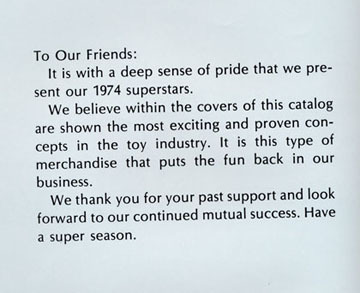 Scans of this catalog were graciously provided by Mike Jimenez--thanks Mike!